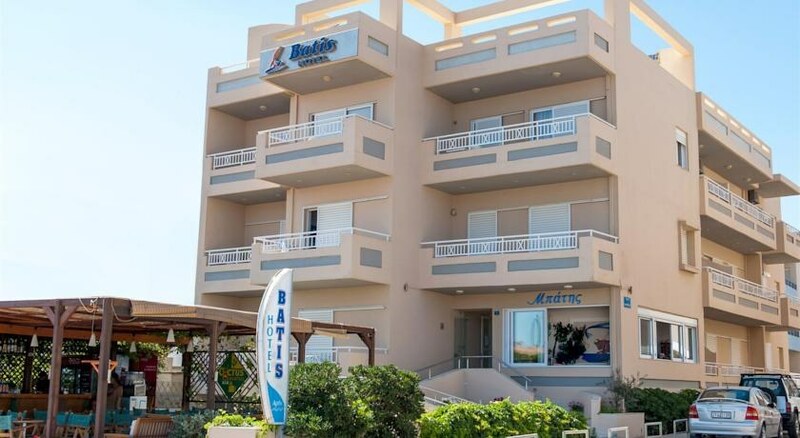 On Rethymnon coast, where the sea touches a long sandy beach, there is the Batis Hotel, a charming beach hotel of furnished apartments so comfortable as a modern house. 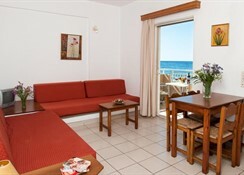 The name was taken from the summer's north east quiet refreshing wind enjoying the friendly family atmosphere that eagerly guide you to discover the coasts, the gorges, the villagers and the beauty of Crete. There is a harmonious alternation of colors and landscapes enjoying the blue sea and the fabulous sunset with a drink at our bar or at our comfortable balconies. 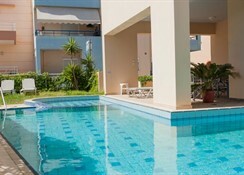 Relax in a natural place near the swimming pool which also offers a section for little children. Every apartment of one or two rooms includes a kitchenette, a refrigerator, a living area, satellite TV, internet, air-conditioning, safe box, radio, hair dryer, a telephone with direct connection and a table with chairs. The center of picturesque Rethymnon with its mazy streets, where medieval buildings coexist with our times, lies at a short distance.